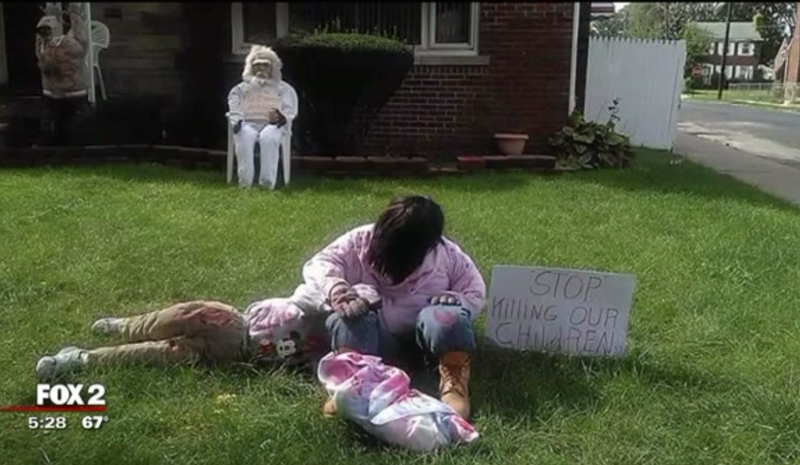 A Detroit woman is getting a lot of attention for her controversial, conversation-inducing Halloween decorations, WJBK reports. The decorations depict the victims of police shootings, neighborhood violence and even the Flint, Mich., water crisis. According to the news station, it isn't the first time the homeowners have shied away from the Halloween tradition of showing the creepy and instead have showed reality, depicting a dead body on their doorstep just last year. "A lady was standing out here yesterday looking at the scene, and she was just crying, just breaking down in tears," Haddon added. "So I came out and I just held her." Haddon only puts the display out during the day, and according to the news station, it is definitely a conversation starter. "It's definitely thought-provoking," Kevin Mays, who came to see the display, told the news station. "It's addressing a whole lot of issues that are going on right now." Some people are so concerned when they see the display, they even call the police, thinking the dummies are real people. "If you're going to get this much attention, you need to do something that's going to make people aware of the situations that are going on," Haddon said. "If we don't open our eyes and see what's going on, it's just going to keep on happening." Haddon is also inviting everyone who stops to see her display to join her at her church to pray at 5 p.m. Wednesday at the House of Prayer at 13001 Fenkell. "We have to start reaching out and helping each other," she said. "If we don't, this scene in my yard is going to continue to be a reality."